Award-winning actor, Kwadwo Nkansah Lilwin has made a shocking revelation that he sometimes charges about to Ghc10,000 cedis just to attend the funeral of people he does not know. The Great Mind International School C.E.O made the point that he does not see why he should attend the funeral of somebody he does not know from Adam upon the invitation of the bereaved relative and go home empty handed, especially when he was asked to make the attendance to give the said funeral some interesting buzz. This in his view is a business move of the family and as such, he should get the needed income from it. 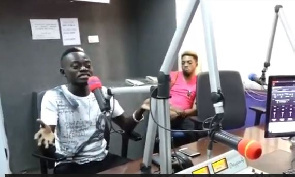 Kwadwo, who is currently the brand ambassador of No.8 Snacks made this rather shocking and hilarious revelation when he appeared on Kumasi-based Agyenkwa FM with B Ice over the weekend. Aside this revelation he made, he also stated that the payment of widow’s mite at funerals is something he and other big-name stars abstain from when they attend funerals.